In the final weeks of Lent, the church enters a period traditionally known as “Passiontide.” In various ways, Catholic churches continue this practice, either by covering statues, subduing music almost to the point of silence, or inviting parishioners to contemplate the cross in various ways. This is undoubtedly essential to the life of the church. And it also has evangelical power. Some may argue that our current secular age is the worst place to present a church focused on the cross. The Resurrection, sure. The birth of Jesus in Bethlehem, definitely, mixed as it is with Charles Dickens, Norman Rockwell and Madison Avenue. But, many say, our age is too self-focused, too flabby and self-indulgent for the brutal sign of a crucified savior to have any currency. And yet, one needs only to consider the intense discipline involved in preparing for a marathon to recognize that our peers are not hostile to discipline. Many of our school students participate in multiple sports at the same time, an endeavor which necessarily calls for discipline. In college, I knew of students who drank like fish except during training season, when they exhibited the kind of asceticism that would make a Trappist blush. The point is this: Americans in 2019 understand the value of suffering on a human and natural level. That’s an opening for the church to present the cross anew. Don’t get me wrong: the cross is a contradiction in any age. It is as much a scandal and stumbling block now as it was when it first took place. But it also has attractive power. I got to see this up close and personal as a seminarian serving the Cathedral’s Good Friday liturgy. For some reason, I always had a role that involved being right at the cross while the people streamed in to venerate it. (Of course, the same thing happens at every parish church as well, and it is very powerful). Some are regulars, of course. Some – at least at the Cathedral – look like they’re in town for a conference or sporting event (there always seems to be some kind of collegiate swimming competition going on). Others look like they ducked out of their high-rise offices a bit early to attend the service. But there are also parents with disabled children, old women barely able to walk, elderly couples who venerate the cross together. I have no doubt that many of these people are what we would call active, regularly practicing Catholics. But there are also the curious, the skeptical, the lukewarm. All this is to say that the cross has a unique evangelical power. It may not be the most pleasant part of our faith, but that’s precisely the point. Our world is so curated, so agreeable. Our devices do what we want them to do in a nice and almost elegant way. Many of our homes offer amenities unthinkable 100 years ago. We even choose which news channels we watch based on which personality will agree with our way of thinking. The cross puts a crimp in our style. It certainly goes against the spirit of the age. But therein lies precisely its strange attraction. That is why many people come through our churches this time of year. It’s not because of sentimentality. It’s because somewhere, at the bottom of our collective psyche, we know that we cannot save ourselves. We know that no matter how pleasant the world we’ve created may be, it is meaningless if our lives are not lived in conformity to the true Creator of the world. And so in these days of Passiontide, may we adore the “terrible beauty” of the cross, so that we may reign with Christ in his Resurrection. 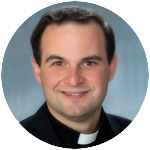 Father Eric J. Banecker is parochial vicar at St. Pius X Parish in Broomall.